Multi-Profile scheduling lets you choose the social profiles you'd like to schedule the same photo/video to, tailor each caption and customize the crop for each network. Plus all your posts will be highlighted in a single calendar view so you can get a better idea of how your social content is planned out for the upcoming weeks! Note: At this time, it is not possible to duplicate an already created post to another profile. From the top of the calendar click the + sign to select the social profile(s) you’d like to view/schedule posts for. Drag and drop the photo you wish to schedule and add a generic caption that can then be edited to fit the character limits for each network. Next, crop your photo to the optimized image size for each network. Last, make the edits necessary for each post to fit the character/posting limits based. Ex. Twitter can only have 280 characters, or select a board to post to for Pinterest. 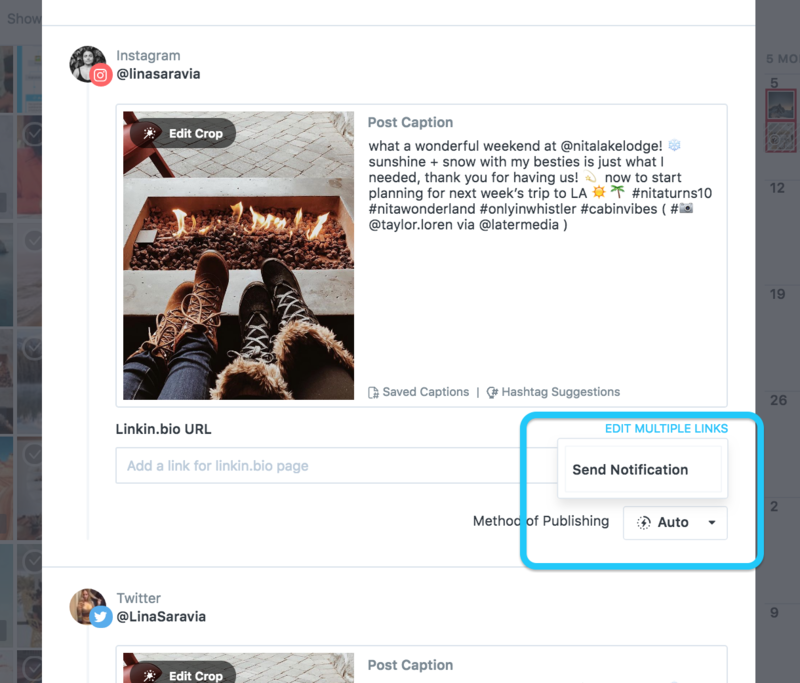 If you've got Auto Publishing to Instagram enabled from Later make sure to select how you'd like your Instagram post to be published either Auto or via Notification. Once you’re done scheduling all of your posts will be visible from one calendar, with each post marked by the colour of the social profile it is scheduled for. To change the posting dates/times drag and drop the post to the corresponding timeslot. And you’re done! To go back to a single calendar view simply click on the social profile you wish to go back to.